In most of my patterns, I demonstrate how to finish lingerie hems with either a twin needle finish, or elastic finish using either picot or fold over elastic. Stretch lace trim is another great option for finishing leg openings. Stretch lace adds a little elastic to leg openings, while reducing the bulk you might get from elastics such as FOE (Fold Over Elastic). 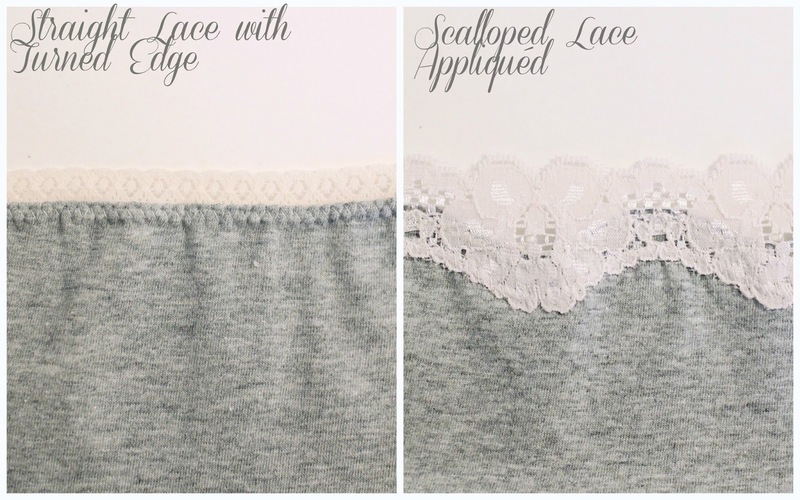 There are a couple types of stretch lace trimming you may find in a fabric store - the first kind has a decorative scalloped edge which gets appliqued to the right side of the garment. The second has a straight elastic edge that can be applied to the garment, turned under and top stitched. Here, I will demonstrate my two favorite ways to apply stretch lace trimming to lingerie. Method #1: Straight Edged Lace, turned under. 1. With right side of the lace against the right side of the fabric, and straight edge running alongside the hem, serge or zig-zag the lace onto the garment. Depending on the type of garment you are sewing will determine what type of tension you want to apply to the lace. If you are using lace around the edge a garment that normally would just be twin stitched at the hem, do not apply tension to the lace. If you are applying lace to an edge that should be contoured, like along the Zooey Bikini Bottom Pattern, apply a slight amount of tension to the lace as you baste it on. You will also want to slightly offset the lace, as you can see in the photos below. 2. For zig-zag stitched finishes - trim back any excess hem allowance extending beyond the lace. Serged/Overlocked finishes will not require trimming (obviously!). Trim back excess- for zig-zag stitched finishes only. 3. Turn seam allowance under towards the wrong side of the garment. With the right side facing you, top stitch with a zig-zag stitch, just like you would if you were applying a picot-edge elastic. Top stitching hem with a zig-zag stitch. 4. Voila! Now you have a lace trimmed edge that is as neat on the inside as it is on the outside. Inside view: Zig-zag & serged lace. Method #2: Appliqued Scalloped lace. 1. In this method, place the lace directly on to the right side of your garment. The hem edge should run along (or slightly extend beyond) the straighter edge of the lace. 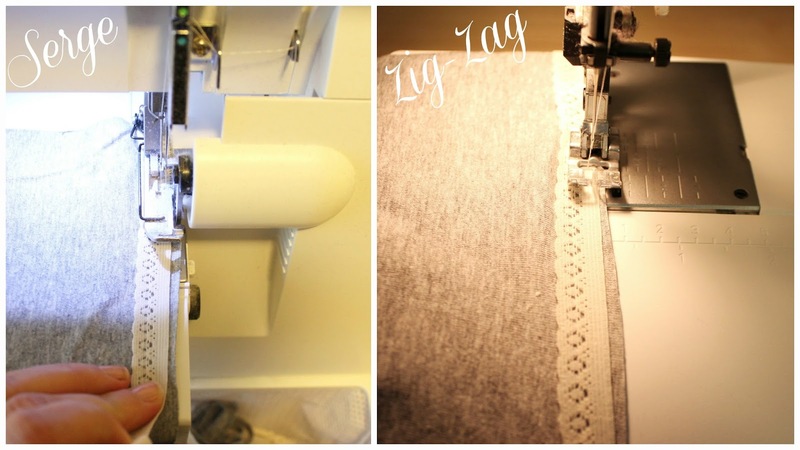 Using a zig-zag stitch, stitch the lace along the scalloped edge directly onto the garment. 2. This is something I do for a little extra security: Stitch a second row of zig-zag stitches about 1/4" down from the first row of stitches. This will ensure that your lace will not come loose from the garment. Two rows of zig-zag stitches "just in case!" 3. Looking at the wrong side of the garment, trim back your excess hem allowance. 4. That's it! Applying scalloped lace takes a little more time, but is a beautiful way to finish a garment. Lace edging is one of my personal favourite finishes. It's pretty and comfortable. The one thing you will want to take note of when using lace is you likely will not want to throw the finished garment in the dryer. The heat from the dryer will quickly degrade the stretch lace. So, remember to hang to dry your lacy-dainties! Thanks for this, Sarah! 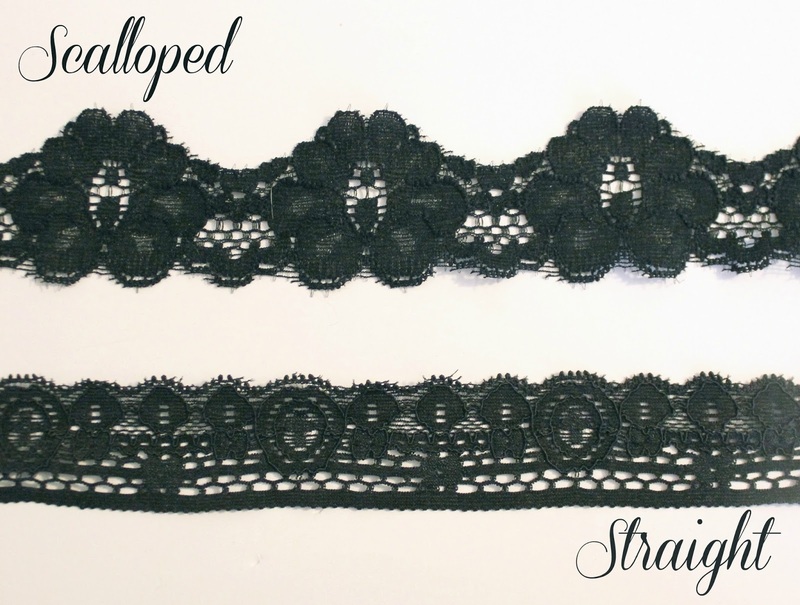 Especially the tips for scalloped lace, I'll be using that! This is a lovely tutorial, thank you. I have a question; what kind of thread to you like to use for the serging? Do you ever use wooly nylon for a softer inside?